Immunogen: Synthetic peptide corresponding to the sequence near the C-terminus of human BAG-1. Application Notes: Detects a band of ~37kDa by Western blot. Scientific Background: Bag-1 is a multifunctional Bcl-2-binding protein that lacks sequence homology with Bcl-2 and its related proteins, and functions to enhance the anti-apoptotic effects of Bcl-2. Bag-1 binds to the intracellular domain of the hepatocyte growth factor (HGF) and platelet-derived growth factor (PDGF) receptors, enhancing growth factor mediated protection from apoptosis. Bag-1 is known to modulate the chaperone activity of Hsc70/Hsp70, serving as a nucleotide exchange factor via binding to the ATPase domain of Hsc70/Hsp70. Bag-1 is known to promote cell survival through activation of the Raf-1 kinase. 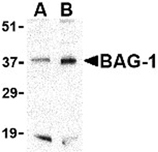 Western blot analysis of PC-3 cell lysate at (A) 1 and (B) 2µg/ml, probed with BAG-1, pAb.